It rained the day that Elysia and Jake were married. 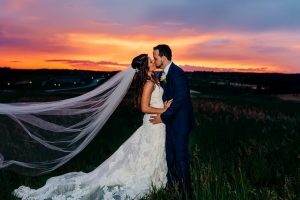 They planned to hold their ceremony on the grand lawn at Bella Collina with its spectacular view of the surrounding area from it perfect perch in Montverde, Florida. Fortunately, Bella Collina offers many ceremony options. They moved their function to the grand entrance way with its towering arches and magnificent fountain. Truth is that the location that they chose, offers even better views and the ceremony sound as provided by the amazing Matt Winter Band was even better than it would have been on the lawn. And so, Jake and Elysia exchanged their vows in front of nearly 100 guests under a magnificent arch, provided by Greenery Productions. They wrote special words to one another which were read by Lon Tosi their Sensational Ceremonies officiant. The words were direct and beautiful in their meaning. Jake wrote in part about his love for who Elysia has become and her humor and love of cats. He feels that she always sees the best in him. Elysia wrote about Jake’s kindness and generous heart and his ability to make every day seem like an adventure. Their ceremony included a reading entitled The Art of Marriage. It speaks about the very essential ingredients of a marriage. The following words for the reading seem to epitomize the relationship of this wonderful couple: Love is never going to sleep angry. It is at no time taking the other for granted; the courtship should not end with the honeymoon, it should continue through all the years. It is having a mutual sense of values and common objectives. It is standing together facing the world. These words will serve as the hallmark of their marriage for years to come. After the cleansing rain, the sun did finally come out and it was spectacular as shown in the gorgeous sunset photo attached. SO Photography did an amazing job of capturing the perfect moment for all-time. Elysia and Jake chose to have their wedding commemorated in a painting done by Nancy Spielman. That gorgeous piece of art will hang on their wall forever as a reminder of their special day! We would be remiss if we were not to mention Sugar Sugar for providing the cake and Kaleidoscope for their amazing lighting which transformed the reception area into a wonderland of light and excitement. Hair and makeup was provided by Kristy Artistry. The bride and her party look so beautiful! Finally, Ashley and Andrea from Weddings Unique were perfection in motion as they orchestrated the entire event with grace and class. They are amazing! Jake and Elysia, you are off on a great adventure! We wish you much luck!